The federal government has announced that it is terminating the contracts of part-time chaplains. Full-time prison staff who are mainly Christian women will now take over the responsibilites of the chaplains former roles. 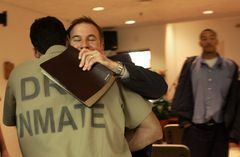 The move to eliminate these chaplains have detrimental implications: it could leave inmates of other faiths without spiritual guidance. Furthermore it could leave them more vulnerable to recruiting by gangs and radical religious groups. Prison Radio's Jean-Marc and Dee speak to Irwin Cutler, NGO-head, previous minister of justice and peace advocator on the implications of the terminated chaplaincy contract. Later we hear from Reverend Tim Smart, an Anglican Minister and Prison chaplain who works in the Eastern townships. He gives us his perspective on the federal government's decision. Lastly, Jean-Marc interviews Reverend Neil Whitehouse, an interim director of chaplaincy at McGill University. He gives us his response on the abolition of the chaplaincy contracts. Aired on: Prison Radio, Friday October 26th, 11-12hr.